If you are looking for the best all around summer camp for your daughter, welcome to Smart Camp! We have designed the perfect set of activities for girls ages 5 to 12 that includes crafts, dance, leadership, parties, team activities, on-site field trips and so much more! As detailed below, we have outlined a sample week’s schedule for you. Each week will follow this outline and will include ALL NEW activities daily that follows our theme. 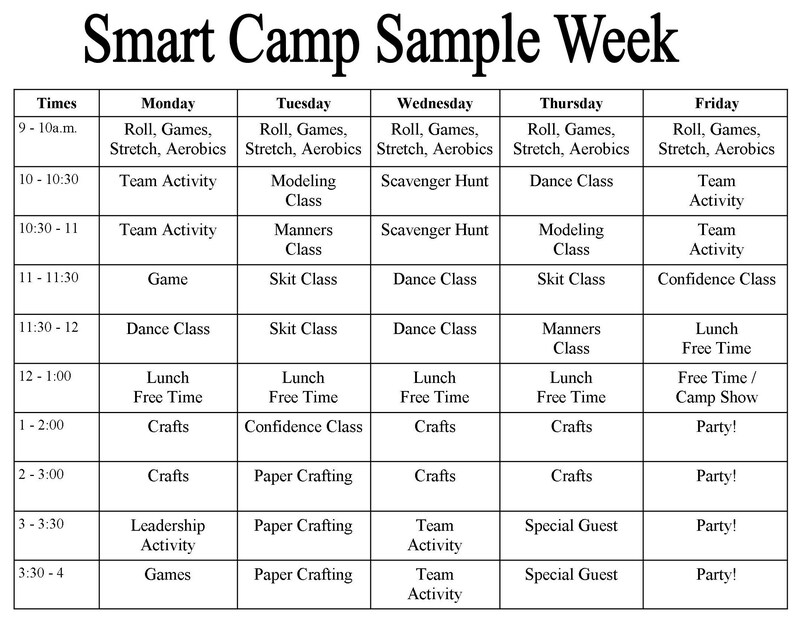 Please click on SMART CAMP THEMES for details. As we will see, we have SO MANY great themes and activities that your daughter will get a entire summer of FUN, informative, exciting, and new activities daily! Our Modeling Class is about modeling YOU, as you are perfect the way you are! We focus on posture and self confidence as well as FUN! Our Skit Classes are designed to be fun and to help all of our young ladies to be comfortable in front of people and work in a group. Our classes include public speaking, skits, games and props. Each week our young ladies will complete various FUN craft and paper crafting / scrapbooking projects. This class is based on FUN, exciting and proven techniques and activities that will build your daughter’s self confidence!